Between November 10 and 12, 1942, Germany and Italy engaged in a joint opera­tion (Unter­nehmen Anton, or Case Anton) to occupy Marshal Philippe Pétain’s Vichy France, the French Riviera, and the French Medi­ter­ra­nean island of Cor­sica. 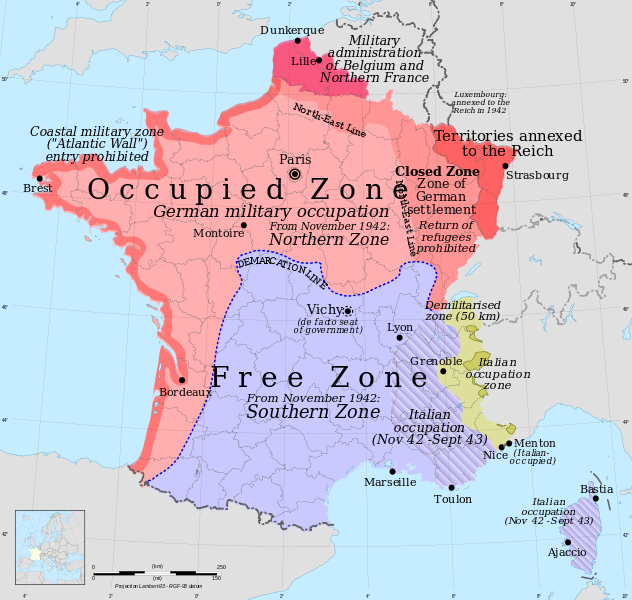 These three areas com­prised the so-called “Free Zone,” which was an arrange­ment by the col­la­bora­tionist govern­ment head­quartered at Vichy that allowed south­ern France, unlike north­ern and west­ern France, to avoid Ger­man occu­pa­tion (see map below). However, follow­ing the Allied inva­sion of French North Africa on Novem­ber 8, 1942 (Opera­tion Torch), Adolf Hitler could not risk an ex­posed flank on the French Medi­ter­ra­nean; hence, Case Anton, planning for which had begun seven months earlier. The Ger­mans next formu­lated Opera­tion Lila with the aim of cap­turing intact the demo­bilized Vichy French Medi­ter­ra­nean fleet at Toulon. (The Royal Navy had damaged some of the French Medi­ter­ra­nean fleet, killing and wounding nearly 1,650 seamen, on July 3, 1940, during the Battle of Mers-el-Kebir near Oran in French Algeria.) By order of the Admiralty of Vichy France, French naval com­man­ders managed to delay the Ger­mans by nego­ti­a­tion and subter­fuge long enough to scuttle 77 ships on this date in 1942 before they could be seized, thus pre­venting 3 battle­ships, 7 crui­sers, 15 de­stroyers, 12 sub­marines, 13 tor­pedo boats, and nu­mer­ous aux­il­iary ships and tugs from falling into the hands of the Axis powers. (Four sub­marines managed to escape the harbor.) Some of the scuttled ships burned for weeks and oil pol­luted Toulon’s harbor for years. French losses were 12 killed and 26 wounded. The Ger­man Naval War Staff was miffed by French “per­fidy.” Hitler, who earlier in the day had told Pétain that he could no longer trust French admi­rals (the com­man­der of Vichy’s naval forces, Adm. Fran­çois Dar­lan, had defected to the Allies in a secret agree­ment un­covered by the Ger­mans), con­sid­ered the elim­i­nation of the French fleet to have sealed the suc­cess of Case Anton. Also sealed was the fate of Pétain’s Vichy France, which had lost its last token of power and its credibility with the Germans. Above: Map showing German-occupied France and the so-called Free Zone, or Vichy-admin­is­tered France, which the Ger­mans and Ital­ians occu­pied in Novem­ber 1942 (Case Anton). Green and purple-hatched areas designate the Ital­ian occu­pation zone up to Septem­ber 1943, when Italy signed an armistice with the Allies. Left: The Vichy French scuttled all ships of any mili­tary value at Toulon, their large mili­tary har­bor on the Medi­ter­ra­nean coast, on Novem­ber 27, 1942. 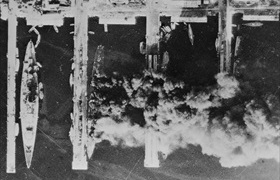 This aerial photo­graph, taken by the Royal Air Force the next day over the Quais de Mil­haud har­bor area, testi­fies to the thorough­ness with which the French sea­men carried out their bitter task: Battle­ship Stras­bourg (left) and crui­sers Col­bert, Algérie, and Marseil­laise. The Stras­bourg, whose bridge remained above water, cap­sized after a U.S. bombing attack on August 18, 1944. Free French Forces of Gen. Jean de Lattre de Tassigny captured Toulon ten days later. Right: Probably the French light cruiser Marseil­laise during the scuttling of the French fleet in Toulon. Anxious that the Ger­mans should not cap­ture his ship, the cap­tain of the Marseil­laise ordered scuttling charges to be set and the sea valves opened on one side. The ship slowly cap­sized as Ger­man soldiers watched from the docks. 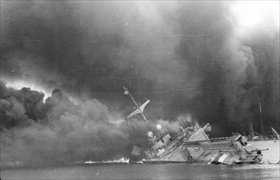 Explo­sions even­tually ripped the ves­sel apart and fires took hold as the last French sea­men aban­doned ship. The ship’s officers were taken prisoner. The ship burned for seven days. 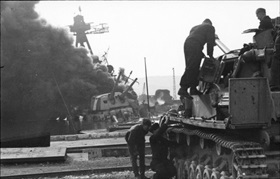 Left: Members of the 2nd SS Panzerkorps watch a burning French war­ship, pro­bably the heavy crui­ser Col­bert. (Terms of the Franco-German armis­tice of June 1940 for­bade Ger­man officers from boarding the demo­bil­ized French ships.) The crui­ser was blown apart when her maga­zine exploded. The Col­bert’s rusted hull remained on the sea floor until 1948, when her remains were scrapped. 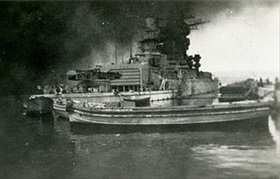 Right: A photograph of the Strasbourg taken on Novem­ber 28, 1942, at Toulon. The Ital­ian Navy refloated the French flag­ship on July 17, 1943, but the armis­tice between Italy and the Allies in Septem­ber 1943 halted these activi­ties and the ship was taken over by the Ger­mans. On April 1, 1944, the ship was returned to Vichy French autho­rities. Her wreck was then towed to the near­by Bay of Lazaret, where she was heavily bombed by the U.S. air­craft and sunk, three days after Opera­tion Dragoon, the August 15, 1944 Allied landings, as part of the preparations for liberation of Toulon.